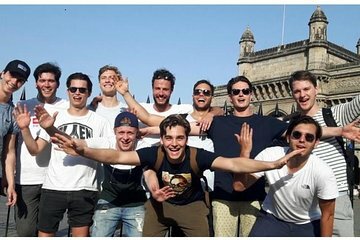 Ammira le principali attrazioni di Mumbai in un giorno con un tour privato in compagnia del tuo autista-guida. Scopri la storia e la cultura dell'India visitando monumenti come il Portale dell'India, la stazione ferroviaria Chhatrapati Shivaji, i giardini pensili, l'Università di Mumbai e il Marine Drive. Il tour include un pranzo autentico e spunti, viaggia a bordo di un veicolo privato dotato di aria condizionata e approfitta del servizio di prelievo e rientro in hotel. if you only have a few hours in Mumbai this tour gives you the main highlights of the city. the guide (Sho) was knowledgeable and took care for everything. Lunch was great to. Thanks! I had a great experience on this tour! I am a female traveling solo for business and was a little nervous about booking a tour of Mumbai online, but I am so glad I did. After booking through Viator, the tour company contacted me by whats app and confirmed the date and location. Sanya, my tour guide, picked me up on time at my hotel and we spent the day touring the sites. She was so pleasant, friendly, knowledgeable and informative. The car was clean and air conditioned with a separate driver. A delicious Indian lunch was included. You can book this tour with confidence! Had a lovely day discovering Mumbai! We visited Our Lady of the Mount Basilica, Marine Drive, Mani Bhavan Gandhi Museum, Antilia and more. Thank you for welcoming us to your city, Sonja, and for customizing the city tour to meet our interests. You are a gem, and Mumbai is a treasure! The guide was very friendly and made the tour exciting. A lovely tour guide, Sanya with much knowledge concerning Mumbai from the North, Central to Bombay City. We truly enjoyed the day, Sunday was very busy, but we were still able to see all the sights even with the traffic. Really enjoyed seeing the Taj Mahal Tower hotel. This was the hotel attacked in November 2008 and has been magnificently restored to its splendor. Lunch was at the Cafe Metro and was some of the best if not the best food, which we have eaten since being in India. This was a diamond found in the hay stack! Our guide Siddhartha Sarkar was very knowledgeable, warm and friendly person. He had true Mumbai spirit which allowed us the see the city through a Mumbaikars eyes. The visit to Leopold Cafe for lunch was the highlight of the trip, where he recommended Keema pav, chicken biryani and garlic chicken kebab, which were all very delicious. This tour and company is amazing! We had one full day in Mumbai so wanted to explore as much as possible. Rahil did not disappoint - he is very honest and showed us all of the sights, this day and tour was one of the highlights of our trip. We made a new friend while visiting, this is a must do! This tour was run by Best of Bollywood tours and Rahul's wife Sanya gave us a fabulous tour of the city. The communication from Rahul was extremely reassuring ahead of the tour sometimes you hear nothing and wonder if they will actually show! but he kept us informed at all points. Sanya was very friendly and knowledgable about Mumbai and told us so much about life not only in Mumbai, but also in India. She reassured us and made us feel safe when we were petrified of the Mumbai traffic! Lunch was included which was not expected and she took us to a lovely restaurant where we had the best curry we've ever had! She was an extremely attentive host. We enjoyed this tour so much that we re-booked for next day for Sanya to take us to Elephanta Islands. Again another fantastic day- she made our time in Mumbai really memorable. She even went out of her way on the 2nd day to take me shopping for a Sari at no notice!. Highly recommended! Excellent tour! It was great 6 hours tour of Mumbai city. We covered all the essentials places. My tour guide, Sanya was glad to accomodate my request to include some shopping during the trip. It was definitely a pleasant experience.